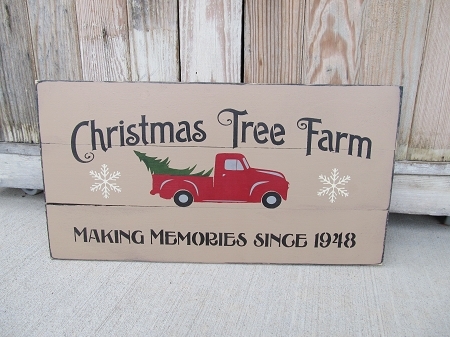 Primitive Hand Painted Christmas Tree Farm with Red Truck Pallet Sign. Featured in the November 2018 Issue of the Country Sampler Magazine. I love painting on these new pallet signs. This one is perfect for the Christmas season with the popular red truck. Hand painted stenciled. Wording reads Christmas Tree Farm. Making Memories since 1948. I love this because my Dad was born in 1948. 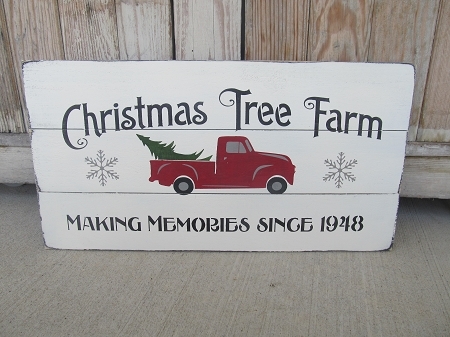 The example displays a marshmallow colored background with the red truck, hunter green tree, grey snowflakes and Black lettering. The edges have all been distressed. Choice of background color and hanging option. Size is 20" x 10 1/2" . Hand painted, designed and signed by Heidi.